Even as club football action is on hold because of the international break, Liverpool’s Gini Wijnaldum and Virgil van Djik still gave their fans something to cheer about as both scored for Netherlands during the stunning 3-0 versus 2014 World Cup Champions, Germany, in a Nations League match. While van Djik headed home the opener after a rebound, it was Wijnaldium’s solo goal in injury time, which left Jerome Boateng embarrassed and flailing on the floor, that would have delighted Red fans the most. Applause might be pouring in from all corners for that genius of a move pulled off by the 27-year-old, but one of his teammate’s words are what every Liverpool fan is gushing over. 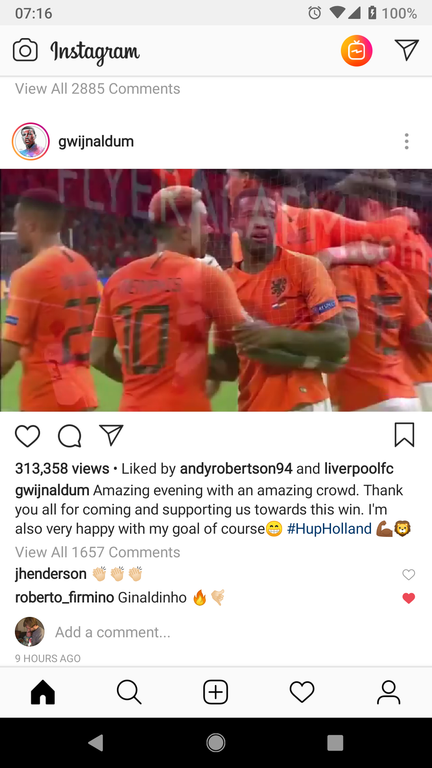 Roberto Firmino took to Instagram to congratulate Gini for his effort by comparing him to a Brazilian genius who used to pull off such moves regularly- Ronaldinho.